KOKOMO, Ind. – While the end may not have been what the squad wanted, the 2018-2019 version of the Indiana University Kokomo men’s basketball team was one for the record books. Playing in its first NAIA Division II Men’s Basketball Championship, the Cougars finished in the Sweet Sixteen before being knocked out of the single-elimination tournament. No. 22-ranked IU Kokomo opened with an 89-83 upset victory over No. 9 Union College before falling to No. 8 Oregon Tech 84-72 in the second round of the tournament held at The Pentagon in Sioux Falls, South Dakota. Against Oregon Tech, IU Kokomo (26-8) took an early lead and maintained it throughout the first half and into the second. 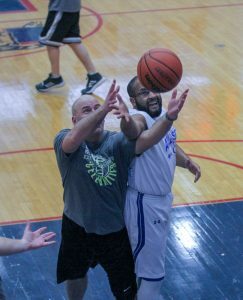 But the Hustlin’ Owls took the lead with 10 minutes left in the second half and never looked back, outscoring the Cougars 46-27 in the final 20 minutes. Kokomo’s hot shooting cooled off in the second half. In the first half, the Cougars shot 16 of 28 (57.1-percent) from the floor on their way to 45 points and a seven-point halftime lead. IU Kokomo finished the game 25 of 60 (41.7-percent). Kokomo won the rebound battle, picking up 42 boards (16 offensive, 26 defensive) compared to Oregon Tech’s 36. The Owls took advantage of offensive rebounds more efficiently, scoring 20 second chance points while IU Kokomo had 11 points. Akil McClain led the IU Kokomo offense in scoring with 17 points, taking eight shots from the charity stripe. Ending the regular season in second place in NAIA Division II in total blocks, Desean Hampton collected six blocks in the game while scoring 14 points. Trequan Spivey and Antoin Cifton each ended the game with double digit points; Spivey had 14 points and Clifton finished with 10. In the opening round win over Union, the Cougars held on as the contest saw seven lead changes before IUK took control down the stretch. By the 4:38 mark of the second half, the Cougars held its largest lead at nine points. Spivey led IU Kokomo with a game-high 28 points on 11 for 17 shooting. Hampton had a double-double of 15 points and 14 rebounds as did Clifton with 15 points and 11 rebounds. Darian Porch added 12 points and six rebounds while freshman Ditwan Gary finished with five points and led the Cougars with five assists. IU Kokomo was one of three River States Conference teams and one of six Indiana teams in the 32-team national tournament field. All three RSC squads delivered with at least one victory. WVU Tech earned a No. 1 seed and won its first game 90-79 over College of the Ozarks before falling to Briar Cliff 99-72. IU East downed fellow Hoosier squad Bethel 83-81 in overtime and St. Francis (Illinois) 77-61 before falling to Spring Arbor 89-77 in the Elite Eight. The Final Four included Oregon Tech, College of Idaho, Spring Arbor (Michigan) and Marian (Indiana); the championship game is scheduled for March 12. IU Kokomo loses just two seniors from the squad – Toby Vanliew and Dante Butler – with core of the River States Conference West Division champs returning. As a whole, the season was extremely successful for the Cougars, which registered a team record 26 wins. Four of the victories were over Top 25 squads: No. 25 IU Southeast on Jan. 8, No. 9 WVU Tech on Jan. 26, No. 14 IU East on Feb. 12 and Union in the national tournament. The No. 22 ranking was the highest-ever for the Cougars and this year marked the first time IUK was ranked in the Top 25 (No. 24 on Feb. 5). Hampton was No. 1 in Blocks per Game (2.676), No. 2 in Total Blocks (91), No. 26 in Total Rebounds (266), No. 42 in Offensive Rebounds per Game (2.471) and No. 48 in Total Rebounds per Game (7.824). McClain was No. 11 in 3-Pointers Made (104), No. 20 in 3-Point Percentage (.452), No. 22 in 3-Pointers Made per Game (3.059) and No. 42 in Total Scoring (572). Spivey was No. 26 in Total Scoring (633) and No. 40 in Points per Game (18.618). KOKOMO, Ind. 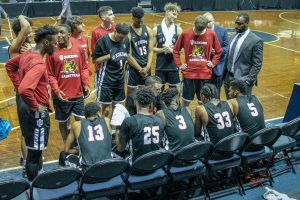 – Boys basketball in Howard County set a new record in 2019 with a three-peat. But it was not a good one. For the first time in the 105-year history of the current IHSAA sectional postseason format, Howard County is without a sectional champion for a third consecutive year. Not since 1921-1922 had a county squad not won a sectional title in back-to-back seasons – until now. Hoosier Hysteria has slammed the door on the five county squads for three straight years – the last teams to do so were Eastern and Western in 2016. Prior to the current draught, Howard County squads had only gone eight seasons without a sectional title over the course of a century-plus. Now they have gone four out of the last five years and five of the 10. Kokomo’s last title came in 2014, Western last won in 2012 and Taylor has not cut down a sectional championship net since 2006. Playing in the Class 3A Sectional 20 at Frankfort, No. 7 Northwestern had the best chance of ending the streak, but someone forgot to tell two-time defending sectional champion West Lafayette, which pulled-off a 45-42 upset at Case Arena. Formerly ranked No. 1 in Class 3A, the Purple Tigers drew a bye and took a 19-2 record into the postseason, which included a 6-0 record against the sectional field. They had already knocked-off the Red Devils in the Hoosier Conference title bout on Feb. 15 and won a regular season game on Jan. 31. But it is hard to defeat the same team three times in the span of 30 days. Tayson Parker led the Tigers with 29 points and 10 rebounds. Western (13-10) also fell in its sectional opener – a 45-38 loss to Maconaquah. The Braves hit two 3-pointers in the first 90 seconds for a 6-0 lead, and they never trailed the rest of the way. Blake Constable scored 14 points to lead the Panthers while Burkely Seekri netted 10. Class 4A Sectional 7 at Kokomo: Kokomo (11-13) started its sectional run with a sensational 62-54 upset win over previously-ranked Logansport (17-5). In a back-and-forth battle, Logan led 15-10 after one stanza and 29-26 at halftime before Kokomo knotted the game at 41 after three. Through the first 24 minutes of action, the two teams had accounted for seven lead changes and seven ties. Logan surged back into the lead at 50-46 with just under six minutes remaining. Deonta Chamberlain then hit a shot in the paint, Jackson Richards canned a 17-footer and Chamberlain gave the lead back to the Kats with a short jump shot near the three-minute mark – a lead they never relinquished. Bobby Wonnell then seemingly put the game away with a 3-pointer just under the three-minute mark. Richards led the offense with 12 points while Wonnell added 11 and Chamberlain 10. After the win, Kokomo had the inside track to the sectional finals, only to get stunned on its home court 44-43 by McCutcheon (7-14). It was a game Kokomo will not soon forget as they hit only 11 of 23 free throws, including a miserable 5 of 13 in the final stanza with the game on the line. Kokomo also committed 17 turnovers. Jayveon White led Kokomo with 15 points while Chamberlain had eight points and 13 rebounds. Class 2A Sectional 39 at Eastern: Eastern (13-11) battled Alexandria in a sectional quarterfinal, only to be turned away on its home court 59-53. The game was tied at 29 at intermission, and again at 36 middway through the thirt quarter. But an 8-0 Alexandria run helped the squad take a 48-41 lead into the fourth stanza – a lead that Eastern could not overcome. Ethan Wilcox and Matthew Arcari each had 12 points to lead the Comets while Antonio Matthews scored 11; Dontae Nolder grabbed 10 rebounds. Taylor (3-20) drew a bye and battled Alexandria (18-7) in the semifinals, only to suffer the same fate as Eastern with a 57-47 loss. 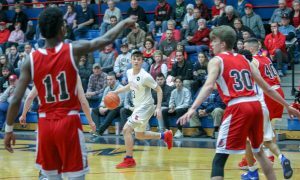 But the Titans gave everything they had, and then some, in its only sectional game of the year as they were tied with Alexandria at 43 midway through the fourth quarter. Alexandria then went on a 14-4 run to close the game and end the Titans season. Tyler Hall led Taylor with 12 points and 10 rebounds, Drew Smith had 11 points and Toric Spires and Jayden Davis each dropped in 10 points.